It will be no surprise to people who visit our website that we’ve started to sell landscaping materials, and since we have there’s been a steady flow of requests from customers for everything from mulch to landscaping fabric. However, some of our requests come from other contracts who are curious why they should buy from another contractor (and potential competition). Much of the time it’s a non-issue because the size, scope, or location of the project is outside our target market. Today we want to share the perks of working with another contractor when you’re buying landscape supplies. 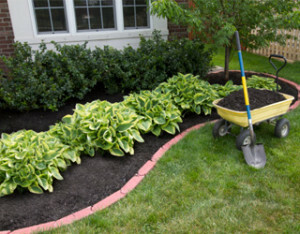 Mulch: Bark mulch in both a basic brown pine, as well as premium black and hemlock mulch. Fertilizer: Seasonal fertilizer from April through November, including insect control and crab grass preventer. Loam and Compost: Including screened loam, compost, and loam compost mix. Stone and Gravel: Including 3/4” blue stone, 3/8” river stone, and dense-grade hardpack. Sand, Dust, and Millings: Mason sand, stone dust, and our popular asphalt millings. We stand by these products because we use them ourselves. See the full listing on the supply page. As fellow landscaper, we can help you figure out how much of a product you might need for your project (this extend to do-it-yourselfers as well). Whether it’s estimating the square yards you’ll need for a parking lot or what grade of gravel for a driveway, we can help. If you find yourself needing help with the installation of these materials, we can even lend a hand with that as part of the delivery. We also know about the importance of the bottom line as a landscape contractor. When you come to us looking for landscaping supplies, make sure to identify yourself as a contractor. We provide a contractor pricing for bulk purchases of all our landscaping materials. We get a lot of thanks for our ability to transport our materials to where they need to go. As a contractor for big projects, we’ve got the vehicle fleet to handle the transportation of all sizes, from pickup truck beds to dump trucks to flatbed trailers. Our rates are per truck load, and may vary depending on weight. Working with another contractor for your landscaping supplies definitely has its perks. If you’re interested in getting contractor landscaping supplies from a company who knows what you need, head over to our Landscape Supply page and fill out the form. Want to learn more about our ability to help with transportation and installation? Make sure to contact Greener Horizon. Even if you’re not a contractor, but are instead looking to perform a little landscaping on your own property, make sure to contact us: it pays to work with the experts who use this material on a daily basis.